God gives it all, then calls us to share. Our personal commitment of ourselves through service in our parish provides a strong and unique connection to God through our community of faith. Stewardship has its beginning in baptism. 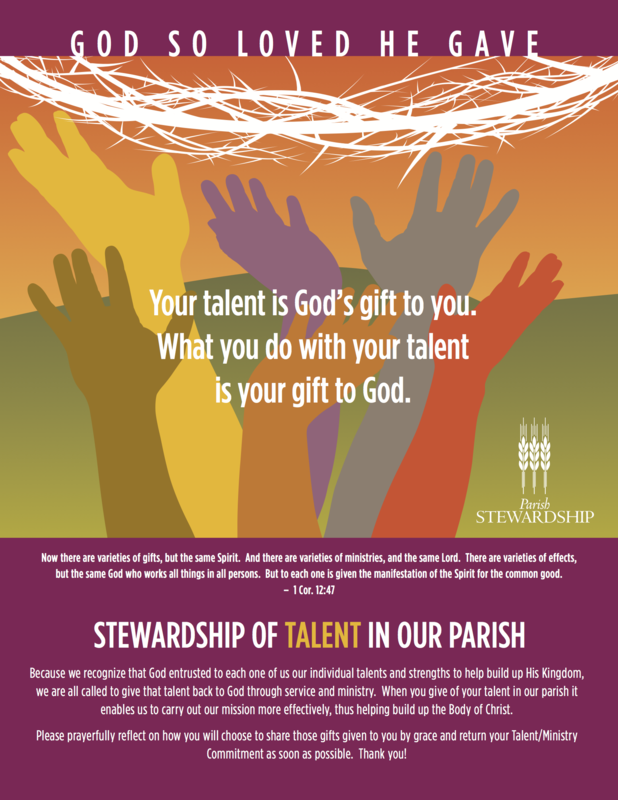 Our baptism as one of Christ’s intentional disciples, calls us to share our gifts— including our talents. Committing our God-given talents to ministry at Saint Patrick Catholic Church is just as important as Stewardship of Time and Stewardship of Treasure. It is how we gratefully give back to God in thanksgiving for the talents He has given us. There are many needs within our faith community that affords us the opportunity to give. Don’t let your talents “die on the vine.” By giving of your talents, we can support our parish’s efforts to carry out the mission Christ gave us. Every year parishioners are invited to recommit to a ministry they are already involved with or commit to a new ministry. In the weeks after the Total Stewardship Commitment Kick-Off, parishioners are invited to prayerfully discern which ministries God is calling them to, while taking into consideration their unique charisms. With more than 50 ministries, each person will find a ministry to serve where the talents given by God are used to serve the mission of the Church. Jesus wants us to serve others just as did. Prayerfully consider how you will be more like Jesus and serve others and making a commitment to walk the mission of the church with the faith community at Saint Patrick Catholic Church. The young people in the parish will complete a Total Stewardship Commitment card along with their parents— as a family. Lead by example— just as Jesus did! After prayerful discernment both individually and as a family, make your Total Stewardship Commitment pledge of Time, Talent and Treasure. There is a place next to each ministry to write the name of the person who is interested or currently serving. Teaching children the convictions Christian stewardship from an early age, prepares them to serve the mission of the Church as they grow. Check out the Ministries section of the website and scroll through the pages to learn about the various ministries and see which ministry your talents are best suited to serve! How Are You Responding to Christ’s Call? Download a Total Stewardship Commitment card today or pick one up at Mass. Prayerful discern your pledge with your family. Then, make your Total Stewardship Commitment!